Timing belt Kit Water Pump Valve Cover Fit 96-00 Honda Civic 1.6 D16Y7 D16Y8. Premium aftermarket Timing Component Kit with Water Pump provides a total solution for most applications, including belts, idler(s), tensioners, and the addition of a water pump. Developed and manufactured for OHC and DOHC type engines, this timing belt provides quieter performance thanks to its molded cog design. Made of wear-resistant fabric and manufactured with high tensile strength cord and molded tooth surface, it ensures consistent slip-proof power transfer and high resistance to oil and engine heat. Application-specific design for a perfect fit. Meets all OEM performance requirements. Manufactured with tough, wear-resistant fabric and high tensile strength cord for high resistance to oil and engine heat. Includes water pumps that are designed and built for long lasting, efficient cooling. Designed to deliver trouble-free, consistent performance. 1 Mitsuboshi Timing Belt (104 round teeth) (Mitsuboshi - OE supplier for HONDA / SUBARU). 1 GMB Tensioner (Bearing assembly). 1 GMB Water Pump w/ Gasket. 4 Spark Plug Tube Seals. Mitsuboshi Established in 1974, Mitsuboshi Belting Ltd (MBL - USA) Corporation has enjoyed continuous growth through the years. This growth and increasing demand for MBL (USA) quality products provided the base for construction of the Illinois Manufacturing Plant which began production in March, 1988. Mitsuboshi manufactured all types of V-Belts, V-Ribbed belts and TIming Belt for both original quipment and service parts in the automotive industry. OEM customers include: Honda, Nissan, Subaru and Toyota. Mitsuboshi is proud to provide innovative belting solutions for these manufacturers, and we back our products with unparalleled service and support. Our belts help achieve a quieter engine, a longer period between belt replacement, and an optimum efficiency of power transmission to help our client's cars go farther for less. GMB is one of largest global manufacturers of OE and Aftermarket automotive products. Since 1943, GMBs manufacturing quality has been recognized within the industry beginning with Tensioner and Idler Bearings, Water Pump, Universal Joints. Over the years GMB manufacturing quality expanded into a variety of quality parts now including Wheel Bearings and Hub Assemblies, Fuel Pumps, Fan Clutches, and Steering & Suspension parts. Each product line has extensive Asian, Domestic, and European coverage that meet or exceed OE standards. GMB has decades of manufacturing and engineering experience within these categories, and serving OE car makers including Hyundai, Kia, GM, and Chrysler. All GMB products are manufactured in GMBs factories in Japan, Korea, Thailand, and China utilizing strict OEM specifications. Genuine GMB parts ensure product quality and safety. GMB offers extensive coverage fulfilling the needs of every customer. 1.6L 1590CC 97CID L4 SOHC. (16 VALVE), ENG CODE "D16Y7". (16 VALVE), ENG CODE "D16Y8". 1.6L 1590CC 97CID L4 CNG SOHC. (16 VALVE), ENG CODE "D16B5". 1.6L 1590CC L4 SOHC. (16 VALVE), ENG CODE "D16Y5". We firmly believe our parts are free from any defects in workmanship, material and that all manufacturing is processed under a strict quality control environment. Absolutely no exchanges will be made for any products that has been damaged, misused or improperly installed. We highly recommend that a licensed professional bear the responsibility of proper installation. Our goal is to provide our customers with the best products at the best price without compromising quality. We have been in the car parts business for over 20 years. We specialize in engine parts and accessories. All of our parts are specially made to meet or exceed OEM standards and performance requirements. No matter whether you're doing basic repairs and maintenance, modifying your car's engine, our great selection of brand name products and knowledgeable associates will ensure success with all your engine rebuild projects. We offer the finest and widest variety of engine parts and accessories using state-of-the-art technologies, and employ the most dedicated and creative team members. These individuals focus on exceeding expectations of customers who want the exact component at the best price in the quickest time. Our goal is to provide the best customer experience during every customer interaction. Whatever you need, whether it's a replacement part to fix a broken down vehicle, a crash part to repair a vehicle from an accident, we will be your one-stop shop. Do you have any questions? Our expert staffs are available 24/7 to help. 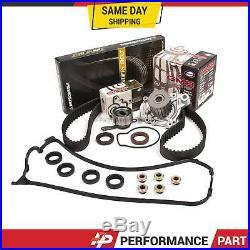 The item "96-00 Honda Civic 1.6L SOHC Timing belt Water Pump Kit Valve Cover D16Y7 D16Y8" is in sale since Wednesday, April 23, 2014. This item is in the category "eBay Motors\Parts & Accessories\Car & Truck Parts\Engines & Components\Timing Components". The seller is "performancepart" and is located in Arcadia, California. This item can be shipped to United States, Canada, United Kingdom, Denmark, Romania, Slovakia, Bulgaria, Czech republic, Finland, Hungary, Latvia, Lithuania, Malta, Estonia, Australia, Greece, Portugal, Cyprus, Slovenia, Japan, Sweden, South Korea, Taiwan, South africa, Thailand, Belgium, France, Hong Kong, Ireland, Netherlands, Poland, Spain, Italy, Germany, Austria, Russian federation, Israel, Mexico, New Zealand, Philippines, Singapore, Switzerland, Norway, Saudi arabia, Ukraine, United arab emirates, Qatar, Kuwait, Bahrain, Croatia, Malaysia, Brazil, Chile, Colombia, Costa rica, Dominican republic, Panama, Trinidad and tobago, Guatemala, El salvador, Honduras, Jamaica.